By the time a train engineer sees you on the tracks it’s usually too late to stop the train. It takes more than a mile for most trains to stop – that’s 18 football fields! If the red lights are flashing and the gates are down, a train is usually less than a minute away. If you’re on foot, you probably can’t run across the tracks fast enough to beat it. 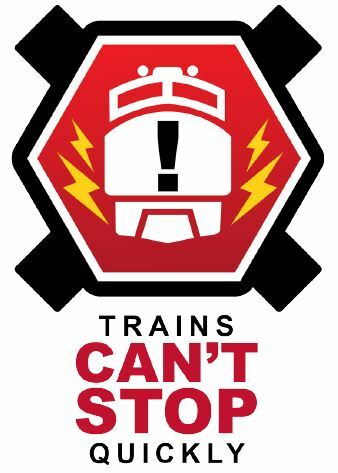 If you’re sitting on the tracks in your vehicle, you may not have enough time to react. The train is faster, bigger, and more powerful – it can’t stop fast enough to avoid you. People have died because they tried to outrun a train. Pedestrians have died because they were walking on the tracks and did not realize how fast the train was coming. Fast-moving trains often give the illusion they are traveling slower than you think. If you’ve ever watched an airplane landing, it often appears to float onto the runway, even though it’s going 150 mph. The same is true for trains. Any approaching train is always closer, and moving faster, than you think. Your life is too important to risk, just to save a few minutes. Don’t take chances when the odds are against you outrunning a train.